Become a regular contributor on Only Passionate Curiosity! This site is monetized through sponsored posts and affiliate links. I earn a small commission from the sale of products purchased via these links. Please see our advertising disclosure at the foot of this page for more information. 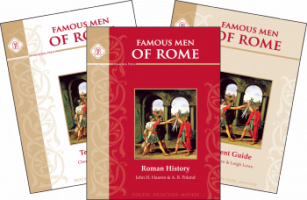 I was so excited to be sent the Famous Men of Rome complete set from Memoria Press for a review. In the past, we’ve used their Prima Latina program, and I loved how neatly organized and well laid out it was. I had heard that Memoria Press’ other programs were just as nice, and I am excited to report that Famous Men of Rome lived up to my expectations. 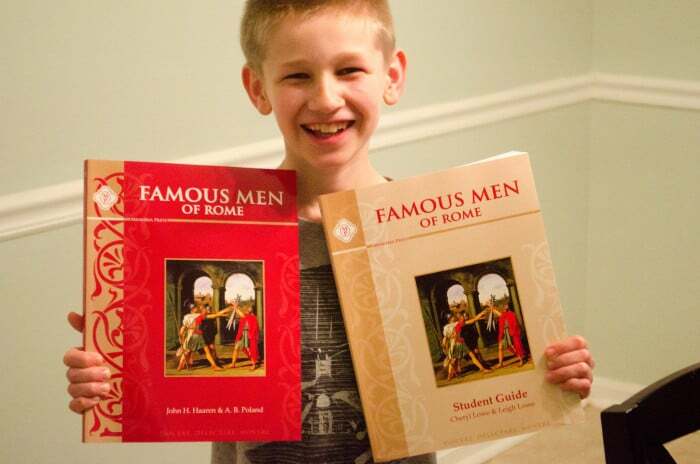 This set comes with the Famous Men of Rome text, the Student Book, and the Teachers Guide. This book set was particularly appealing to me because our last home was in Wiesbaden, Germany, which sits right on the Rhine River in Germany. The Rhine was the edge of the Roman Empire in what is now Germany, and many of our field trips were to see Roman ruins and museums. We were able to see ancient ruins of ships, temples, amphitheaters, and a whole museum of mosaics and busts. At the time, I didn’t know a huge amount about Roman history, but their art and life fascinated the kids and I. What is Famous Men of Rome? Famous Men of Rome is a text that follows the leaders of Rome from the origins of the empire to its fall. 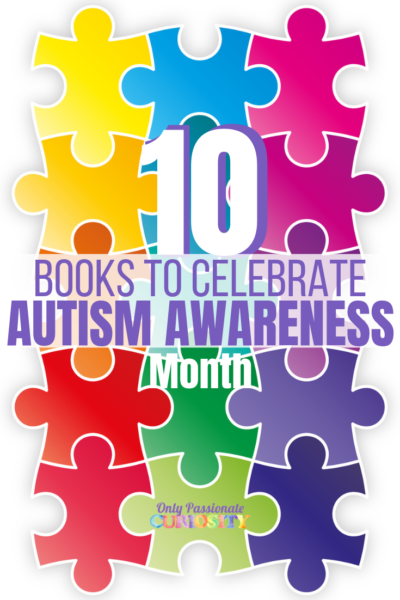 Each chapter focuses on one person and tells their story. Along the way, the book includes full-page, color images illustrating the stories, as well as black and white drawings and pictures of things like Roman coins and busts. What is the Student Book Like? The student book contains “important facts to know” which explains the who and what of the story in list form. It also includes a vocabulary section, with a place to write the definitions for the more difficult words in the text. 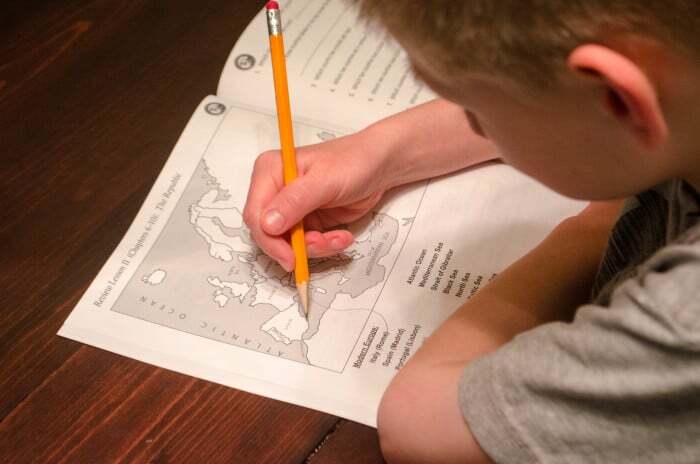 There is a section of comprehension questions to help your child recall the most important elements from the story, and then there is an activity section with more involved questions (some require research), map work, and conversation prompts to look more deeply at what happened in the text. Every 5 lessons is a review section which includes everything from map work, to matching quotes to the speaker, defining vocabulary, writing down the timeline and more. This book series is recommended for grades 4-8. Bug is on the lower end of this spectrum, so I did expect him to find the program challenging. The text uses adult vocabulary and the content reads more like a textbook than a story. I had planned on having Bug read the text on his own while I was at work, but I quickly realized it would be more effective for us to read together, so I could help with the pronunciation and meaning of the more difficult words and phrases as we read. Reading together with this program worked very well, and if your children are on the younger end, I would plan ahead to do that. I personally think the book is most appropriate for 7-8th graders. 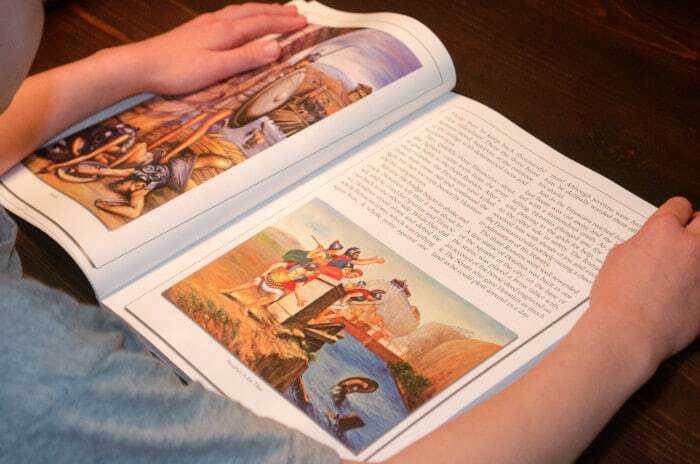 One thing that did help is that the book uses larger font, and includes large, colorful pictures. 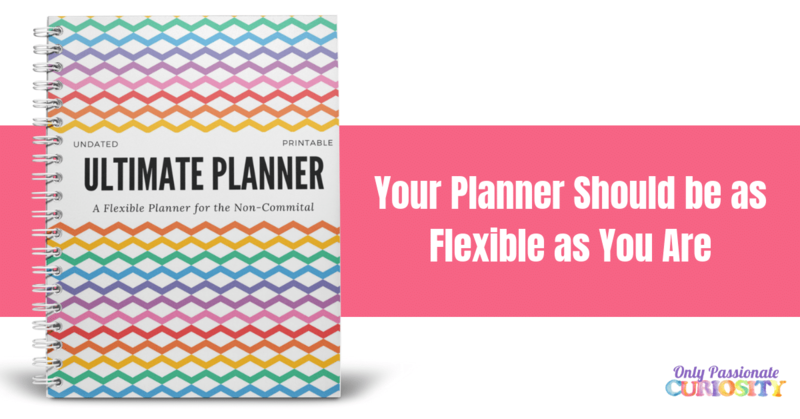 The pages are glossy and sturdy, and it’s a very pleasant book to read from. 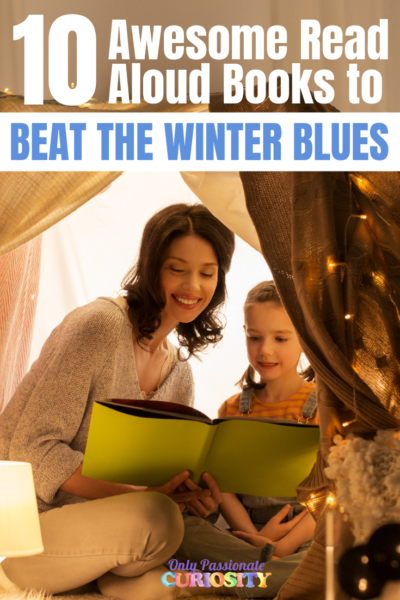 Even the younger kids liked to come look at the pictures when we read, and despite the challenging vocabulary, Bug never did get intimidated by this book, mostly because he is drawn to the beautiful pictures. Because of the challenge level, by the end of the review period, we also began completing the activities in the student book orally. I found that Bug took more time, and gave me more thoughtful answers when I asked him to explain verbally, rather than write his responses on the lines of the student book. While many of the comprehension questions asked simply required him to recall content, they often were wonderful jumping off points for deeper conversation. Bug and I really enjoyed our time in this book. The stories and history are fascinating, and the conversations we had together were the highlight of our day. I am setting it aside, however, until next school year (2016) when we circle back to Ancient History again now that our time reviewing it is up, and I anticipate that he’ll get even more out of it as a 6th grader. If you follow the classical model of education, and prefer to complete history in a cycle, I highly recommend adding this book to your ancient history studies for your middle-grade students. 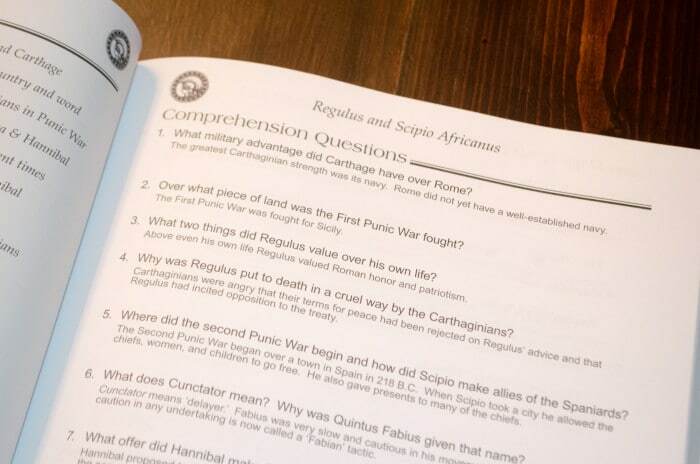 This is a wonderful complement to elementary ancient history programs, and would allow an older child to dig deeper into the history of Rome if you were working as a family. I wish we had purchased this a couple years ago when we were in Europe so I could have used it for self-study before our field trips! Success! Now check your email to grab your "I Heart Math" Activity Pack! Proud Military Wife and Homeschool Mama to four wild and wonderful little people. I am a curriculum junkie, and hoard way too many different programs in my classroom closet, which has now taken over the home office. If I am not teaching the kiddos, talking too much on my blog, or napping; I am eating excessive amounts of cake. You can never have too much cake. Save yourself a little bit of time, and join the OPC family! 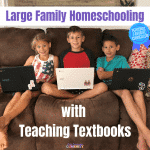 Get all of our printables, giveaways and homeschooling resources in your inbox.